On January 25, 1780, Reverend Caldwell’s church was burned down by the enemy. He moved his family to the parsonage at Connecticut Farms (now Union), New Jersey so that they might enjoy a safer life. Unfortunately, this was not to pass. On June 6, 1780, General Knyphausen crossed over from Staten Island into New Jersey with six to seven thousand German soldiers. The goal was to reach Morristown, where the Rebels had their quarters and supplies. On the seventh, Knyphausen’s command marched to Elizabethtown where he drove the Rebel soldiers back. Stephan Popp, a Hessian soldier present at this time, wrote that they “marched close to Springfield, burned down many houses on the way and destroyed very much. On our side many were also killed and wounded.” They retreated by way of Connecticut Farms. The New-Jersey Journal of June 14th reported that Hannah Caldwell, the Reverend’s wife, “with a babe of eight months, and one of three years old, with the housekeeper and a little maid, were left. Mrs. Caldwell having dressed herself, and put her house in order, retired into a back room[…. ]One of the barbarians advancing around the house, took the advantage of a small space, through which the room was accessable [sic], and fired two balls into that amiable lady, so well directed that they ended her life in a moment.” Hannah was then stripped of part of her clothing and the house pilfered before it was set ablaze. Eleven more houses were also set on fire. The Hessian, Popp, recorded in his diary that three boats of wounded Englishmen and Germans were brought back to New York the following day, while another Hessian soldier reported over 300 killed and wounded. Stephan Popp claimed that about one hundred men perished in the burning of the church, as they were not allowed out of the building. If the fire was set to cover the retreat of the British and Hessians, it was not successful. They were pursued by the Americans to Elizabethtown, and suffered heavy losses. The combined British-Hessian forces lost 400-500 men, mostly on the retreat. The loss of the Americans in killed and wounded was 600-700 men. Caldwell remained involved throughout the war in the cause of the Patriots. On November 24, 1781, only about a month after the defeat of the British at Yorktown, Virginia, Caldwell was at Elizabethtown Point, picking up a Miss Murray, who had come from New York, under a flag of truce. After walking her to his carriage, he returned to the boat to retrieve a package that was left behind. On the return back to his carriage, an American sentinel, named Morgan, challenged him, asking what was in the package. Caldwell attempted to proceed to the proper officer with the package, but as he attempted to move away, the sentinel, just relieved from duty, fired his musket, killing the Reverend Caldwell with two balls. Morgan was arrested and tried for the murder of Caldwell; he was condemned for his crime and executed. The Reverend Caldwell and his wife were buried in the churchyard of the First Presbyterian Church in Elizabethtown. Sixty-four years after his death, on November 24, 1845, James Caldwell became the first person in Elizabethtown to have a monument dedicated to him, done so by the Sons of Cincinnati. Hannah was also honored, in a different manner. The seal of union County, New Jersey, features the murder of Hannah Caldwell. This number was reported by Stephan Popp, a Hessian soldier. A Hessian Soldier in the American Revolution: The Diary of Stephan Popp. Trans. Reinhart J. Pope, private printing, 1953, page 16. The housekeeper was Catherine Benward and the “little maid” was Abigail Lennington. New Jersey in the American Revolution, 1763-1783: A Documentary History edited by Larry R. Gerlach, page 312. Popp, 16; and A Hessian Diary of the American Revolution by Johann Conrad Döhla, Translated, edited by Bruce E. Burgoyne. University of Oklahoma Press, Norman 1990, page 128. The Romance of the Revolution: being true stories of the adventures, romantic incidents, hairbreadth escapes, and heroic exploits of the Days of ’76. by Oliver Bell Bunce. Porter & Coates, Philadelphia, 1870, page 258. Elizabeth: The First Capital of New Jersey. by Jean-Rae Turner & Richard T. Koler. Arcadia Publishing, 2003, page 51. 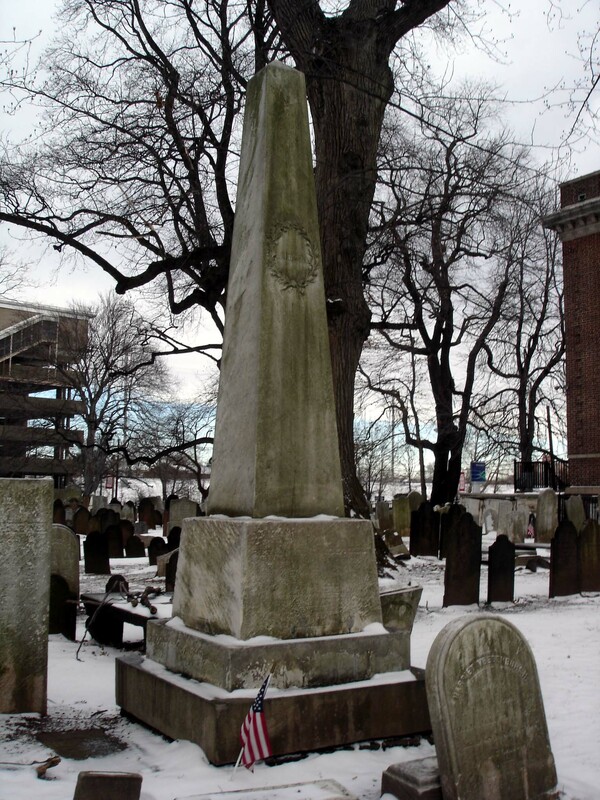 Image credit: Grave marker of James and Hannah Caldwell at the First Presbyterian Churchyard in Elizabeth, NJ, taken by the author in January 2006.